You wouldn’t modernize a house without fixing its rickety foundation first. Similarly, your BI and analytics environment needs a firm foundation before you can update it. When you first start considering a modernization effort you’re likely to be bombarded with advice: just choose technology X or product Y and it will be easy. But whatever that advice entails – big data, data discovery, self-service BI, anything on the cloud, machine learning, micro services, etc. – don’t expect them to lead you to data Nirvana so easily. While modernizing your BI environment may indeed involve one or more these technologies, your efforts need to include not just products but also architectural, methodology, process and people (skills and cultural) changes to be successful. Without these changes, your successes are apt to be just tactical and short-term. Longer-term, you’re probably creating the next data silo that will deepen your data woes. When vendors and pundits pitch their technologies and products they often compare them with existing BI and data warehousing implementations to illustrate their superiority. But this is like the proverbial apples to oranges comparison. They’re usually comparing a pristine proof of concept of the new technology to a not-all-that-flattering implementation of existing technologies and products. Keep in mind that the existing implementations are dealing with real-world data silos, data governance issues, and streams of new projects implemented without thought to a data architecture and politics. In addition, many existing BI and DW implementations did not follow best practices, so regardless of the technologies and products used they were destined to provide lukewarm results. 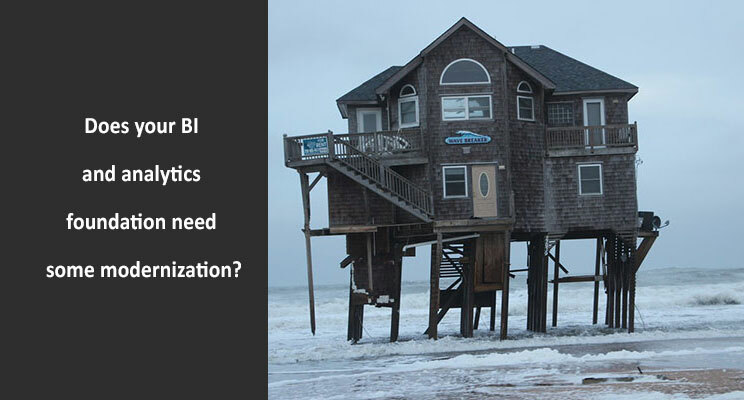 Regardless of what you do, modernization efforts need to be guided by the all-important goal of increasing the ROI from your BI and analytics efforts. A good foundation will give your modernization efforts the support they need to maximize your ROI – and keep from toppling over.